This is my other hobby. Yes I have many hobbies. I garden. 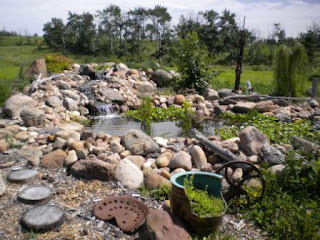 I have a water pond and a few kio fish. I have to show off my blue Delphinia flowers. They are taller than me this year. Maybe over 6 feet high. I get many hummingbird coming to feed. Do not look at the weeds. It has been very wet and rainy. When the rain does stop the mosquitoes are so bad. I have not done a good job weeding for a few week now. I plan to quilt most of this weekend. Check out these delphiniums from a flower garden in PEI. Your garden looks beautiful- I love the rocks with the pond but my favorite things are your flowers. 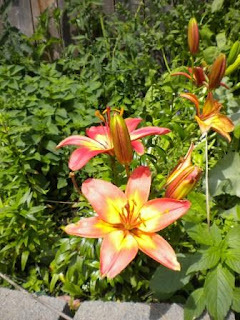 I am afraid that I am not that gifted - I have a black thumb when it comes to growing flowers- my sister and father are the masters of the garden in my family. My sister is a horticulture designer ( she took her courses at Olds) and my father just loves growing things. 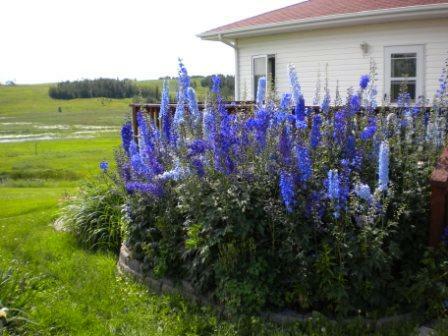 AT the age of 80,He still has a nice garden and beautiful flowers in spite of all the rain in the Red Deer area. He can not grow clematis -though he has tried many times. He has lovely perennials in his backyard that include lilies, irises, columbine and monkshood. Thanks for sharing your flowers. I need to go and finish the back of my quilt. I finally finished the top of the music quilt.